the name that can be spoken is not the true Name. Nothing can be said about the Tao. It's ineffable. So we can all go home, right? To start with, it's a philosophy, not a religion. However, there are many religious sects based off of Taoism. The line between philosophical and religious Taoism is very, very blurry. Philosophically, you can sum up Taoism thus: "Go with the flow." All problems in life come from going against the natural order of things. Passive virtue is superior to imposing your will, and poverty is better than great wealth. Taoism in its "pure" form is non-dualistic; both light and darkness, good and evil, active and passive qualities are contained within the eternal, flowing Tao. Everything in the universe is made up from the flow of two equal, opposite, and interpenetrating forces. Yang is solid and masculine, represented by white in the traditional symbol you often see in martial arts movies. 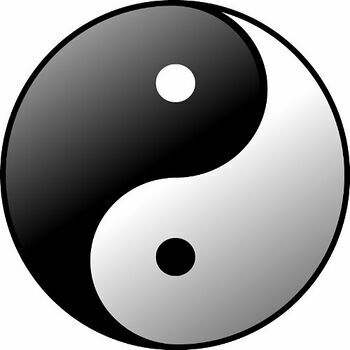 Yin, the feminine and passive quality, represented by black. When casting the traditional Yijing hexagram, Yang is solid yarrow sticks and Yin is broken sticks. From boundless nothingness (wuji) comes the duality of Yin/Yang, and from the duality comes "ten thousand things" as said in the Tao Te Ching. Of course nothing is really that simple. Taoism is deeply infused with Chinese animism and cultural beliefs. Taoism has a variety of sects with sweet names like "The Mighty Commonwealth of Orthodox Oneness" and "The School of Complete Reality." Many Taoist sects are deeply concerned with the individual soul, and are famed for discovering gunpowder in their pursuit of an alchemical elixir of immortality. Beyond all this, Taoism, like all Chinese religions, got liberally mixed up with Buddhism once it arrived in China in the sixth century CE. Most significantly, a Taoist philosopher of the Warring States period, Zhuangzi, was famous for telling parables and inventing koans. A few centuries later, Zhuangzi's style got mixed up with Mahayana Buddhist theology to create the school of Chán, known to the West by its Japanese name: Zen. Offered for your edification is one of many translations of the Tao Te Ching. Other important texts include the Zhuangzi, which is best known in the west for the story about being a man-dreaming butterfly, or a butterfly-dreaming man. Of the traditional Chinese religions, Taoism has substantially higher appeal in the West than Confucianism, if only because the latter is so concerned with politeness and filial piety, whereas Taoism actually has things to say about spiritual matters. Possibly the most notable non-Chinese Taoist is Ursula K. Le Guin, who inserts Taoist themes into her works and has written a commentary about the Tao Te Ching. Chinese Ghost Story: One of the main characters is a reclusive Taoist wizard, who at one point has a musical number rapping about Taoism. Woochi: A Korean movie about a Taoist wizard. It's a bit of a stretch as far as religious accuracy goes though, in all probability. Moment in Peking: The heroine's father is a follower of Taoism, and at one point leaves home to become a hermit. The Tao of Pooh: Author Benjamin Hoff attempts to explain tenets of Taoism by comparison with A.A.Milne's Winnie the Pooh characters. Oracle of Tao: Strangely subverted. There is a Taoist temple, and many Taoist teachings. The subversion is that although this includes Taoism, it also includes Christianity, and a syncretic religion called Aiken. And some very strange cults, like the Church of the Holy Maple Tree.